Ten Buffalo State museum studies graduate students are helping to shape the narrative of a mural depicting 28 national and local civil rights leaders that will be showcased in downtown Buffalo, New York. Four Buffalo State alumni are the chosen artists to bring this mural to life. Last summer, Benjamin Christy, dean of the School of Arts and Humanities, contacted the Albright-Knox Art Gallery about fostering opportunities for Buffalo State students. From that conversation, Cynthia Conides, associate professor of history and social studies education and director of the museum studies program, connected with Aaron Ott, the Albright-Knox’s curator of public art, to collaborate on a project. Now, students in Conides's Museums and Society spring course are conducting research on the Freedom Wall, a public art initiative the gallery has commissioned in partnership with the Niagara Frontier Transportation Authority (NFTA). “This is a perfect project for Museums and Society students as it explores the idea of museums connecting with communities and acting as a catalyst for societal change,” Conides noted. Located at the corner of Michigan Avenue and East Ferry Street, the mural will span 300 feet on a concrete wall surrounding the NFTA Cold Spring Bus Maintenance Depot property. The art gallery commissioned artists John Baker, Julia Douglas, Chuck Tingley, and Edreys Wajed—all Buffalo State graduates—to paint the portraits this summer. But first, in the true spirit of public art, the Albright-Knox held a series of public meetings from February through mid-April inviting community members to weigh in on which civil rights leaders they would like to see included. The public identified 250 people. The students are researching the entire list, finding photographs and writing up brief biographies on each person, Conides said. Ott organized a selection committee, of which Conides is a member, to narrow the massive list to the final 28. 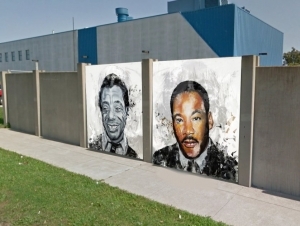 Pictured: A rendering by Tingley of potential mural portraits of James Baldwin and Martin Luther King Jr. Image courtesy of the artist.